My experience as a member of the U.S. armed services was a long time ago. It was also far removed from a battlefield. I was an Air Force public information officer during the Korean War. I was part of a team, serving my country. All these decades later, I still feel a loyalty to, and a deep respect for, anyone who signs up for active military duty. For this reason, though far removed from my own active duty days, I can still feel an intense fury toward the journalists and politicians who have stumbled over themselves to demonize a U.S. army sergeant who has just been saved from enemy captivity through a prisoner exchange orchestrated by his Commander in Chief. Do these people have no shame? Do they not see that because of their need to either attack or stand apart from the President’s decision, they are acting as jury and judge against an American citizen? Do they, some of whom have also served on active duty, like Senator John McCain, Republican of Arizona, realize that those who judge U.S. Army Sgt. Bowe Bergdahl, expose themselves as political sycophants? The majority of the politicians who have rushed to demonize a 28-year-old army sergeant, are Republicans, egged on by the Republican party’s media bull horn, Fox News. It was on Fox that one talking head, angered by the long beard Sgt. Bergdahl’s father has grown, blurted out, in a display of religious bigotry, “he looks like a Muslim”. Another Fox commentator added racism to her religious bigotry by saying “if his skin were darker, he would look like a Muslim”. These Fox commentators were also disturbed that Bergdahl’s father had been studying a major Afghani language. Why would a father learn a language his son has been been forced to use for five years? Why, indeed. Democrats were more discreet, but just as self-serving, when they quickly turned on President Obama with whining complaints that had more to do with their political egos and political security, than with the rescue of an American soldier. Senate Intelligence Committee Chair Dianne Feinstein, Democrat of California, says she was disturbed that the prisoner exchange was conducted without final consultation with her congressional committee, as mandated by recent congressional action. Two things are wrong with her demand. One, she knows that the negotiated agreement with the Taliban would fall apart if word of it leaked; and two, she knows the congress leaks like a sieve. The President and his leadership team, including the head of the Joint Chiefs, determined that Bergdahl was in a seriously deteriorating health condition. Feinstein told Politico that she had seen no evidence that Sgt. Bergdahl’s life was in any danger. Senator Joe Manchin, Democrat from the conservative state of West Virginia, after seeing a video of the soldier, disagreed with the decision to move quickly on Bergdahl’s release. He did not think Bergdahl’s condition was fragile enough to justify a swift swap. Senator Mark Kirk, Republican from Illinois, who recently was hospitalized for a stroke, and who returned to duty in the senate with a courageous walk up the senate steps, had a different take on Bergdahl’s situation. He found him to be in a shaky fragile condition. Who you gonna believe, a senator protecting her committee prerogatives, a senator fearful of losing his Senate seat, or the President and his leadership team, who are responsible for the life of an American soldier? On their tiny, remote base, in a restive sector of eastern Afghanistan at an increasingly violent time of the war, they were known to wear bandannas and cutoff T-shirts. Their crude observation post was inadequately secured, a military review later found. Their first platoon leader, and then their first platoon sergeant, were replaced relatively early in the deployment because of problems. But the unit — Second Platoon, Blackfoot Company in the First Battalion, 501st Regiment — might well have remained indistinguishable from scores of other Army platoons in Afghanistan had it not been for one salient fact: This was the team from which Sgt. Bowe Bergdahl disappeared on June 30, 2009. After Bergdahl’s disappearance, he spent five years in captivity, held by the Taliban in the mountains of Afghanistan. On May 31, he was turned over to the U.S. army in exchange for five Taliban prisoners who had been held since 2002 in the U.S. military prison in Guantanamo Bay, Cuba. How the sergeant (promoted from the rank of private during his captivity) was captured by the Taliban is unclear. But, for the moment, that does not matter. The army will determine, through its own legal system, what placed this particular soldier in the control of the Taliban. At the moment, Sgt. Bergdahl is under medical care, preparing to return home to his parents in Hailey, Idaho. The military justice system will have to determine what comes next for Sgt. Bergdahl. For now, this nation can rejoice that our last remaining soldier held by enemy forces, is finally free. The administration’s legal authority to move the men who’ve been cleared for release is much clearer than it appears in the Bergdahl swap. According to the National Defense Authorization Act passed last year, the secretary of defense needs only to notify Congress of any prisoner transfers thirty days beforehand. Mr. Kerry, in some of his first public remarks on the exchange, struck a decidedly tough tone, dismissing as “baloney” the suggestion that terrorists would have new incentive to kidnap Americans. . . .
Just weeks ago the president of Uruguay, Jose Mujica Cordano, offered to accept six of the cleared men as refugees. Secretary of Defense Chuck Hagel said on May 28 that he would decide to reject or accept the proposal “fairly soon.” Now that Obama has shown a willingness to push legal boundaries in order to move detainees whose designation as a threat seems at least plausible, the circumstance of men like Diyab, who the government never intends to charge with a crime, is even more indefensible. “Leave no one behind on the battlefield” is a sacred and long-standing U.S. military commitment. President Obama honored that commitment with his carefully-negotiated prisoner swap for Sgt. Bowe Bergdahl. Presidents are fair game for criticism. When they get it right, we must say so. The picture at top of Sgt. 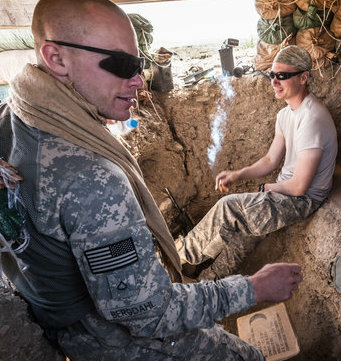 Bergdahl, taken in 2009 on the battlefield in Afghanistan, is by Sean Smith of The Guardian. This entry was posted in John Kerry, Obama, Politics and Elections, The Human Condition, War. Bookmark the permalink. While I don’t have Jim Wall’s military credentials I did hold my breath for a long nine months while our grandson served in a remote area of Afghanistan. But I agree 100 percent with Wall’s conclusions regarding Sgt. Bergdahl. Wall points out that the Republican machine is looking for any and all ways to push President Obama into a meat grinder. Those same Republicans (and a handful of Democrats) should remember that Obama was elected and re-elected after he promised to get us out of Iraq and end the longest war in the nation’s history. And the Republicans need to recall how many Americans and others died in the wars that President Bush rushed into headlong. Obama has been a sensitive and wise Commander in Chief. Typically great post, Jim. Thank you. Re soldier Bowe Bergdahl: CNN’s and, I’m sure, other earnest talking heads are wondering endlessly if the “terrorist” Taliban subjected the poor man to physical or emotional torture during his 5 years as a POW. Horrors!! Do you think he might have been water-boarded? Oh, please just say no, Bowe. That torture is our torture and is perforce okay. –It’s still June 8th at my computer station. Jim, I, like you, have prior (Army enlisted, 1963-67) military service. Just three weeks after my May 1967 discharge, the Zionist Israeli air and naval forces attacked, with intent to leave no trace, the USS Liberty on 6/8/67. 34 slaughtered, 171 maimed, the brand-new ship reduced to scrap…all because LBJ and military elites “left many behind on the battlefield.” Every commander in chief after LBJ, including the current POTUS, has been equally derelict in refusing to engage a credible process of investigation and accountability. There is no justice for the dead and rapidly thinning ranks of aging Liberty crewmen. It still rankles…. Can anyone suggest an outlet for real news that isn’t pushing its own agenda? TV news leaves me with the distinct feeling that the intent is frighten me into never leaving my house, glued to the TV, ordering off the internet everything offered by the commercials. Well said, Mr. Wall. Thank you. Thank you for capturing some of the rage many of us feel. It must be said that most of the GOP, maybe nearly all of it perhaps, has NO shame. What’s truly sad are the Democrats who are so insecure politically, or who are simply craven. This whole episode has been despicable. What’s saddest of all is that there will likely be absolutely no accountability. I am not an American so maybe I have no right to comment on this issue, but I cannot help feeling sorry for all the American soldiers whose leaders have been sending them to fight somebody else’s war. Why should Sgt. Bowe Bergdahl be in Afghanistan in the first place? I am sure his family are very happy to have him back, and I hope Mr. Obama will close the Guantanamo prison once and for all as he had promised at the beginning of his presidency. Thank you for this incredibly thoughtful and thorough article. Not enough thoughtful and honestly motivated people have spoken up on this issue, and I appreciate that you did so. Even after countless members of his platoon call him a deserter, you are going to defend this coward? So smear his platoon and the people who were on the ground with him. You are a disgrace sir. And so we hand over murderous terrorists who will kill again, for a coward and a traitor. You are so blinded by your hatred of Republicans that you have no grasp of reality. Just because we are retreating from Afghanistan doesn’t mean the war is over for them. Welcome to the new America, where we screw our Allies and embolden our Enemies. Oh, and leave our Marines in Mexican prisons. Foolish, foolish, people. Jim, you said it all and said it so well. We are all grateful for your thoughtful analysis of this act of the administration that has been so vilified by members of the G.O.P. who only wish to destroy this president.